There’s a cool idea at hand here, based on a short film about video game pieces coming to earth, but in the hands of Adam Sandler, the dumb jokes get more time than the creative ideas, and this one does end up falling kind of flat. As a nostalgia piece, like Wreck It Ralph, bringing the viewer back to the world of old video games and video game characters, this movie works. The idea about aliens receiving the games from us a few decades ago, in a time capsule, and interpreting them as measures of attack, is pretty clever. So are the characters and casting here. What doesn’t work is the humor or the directions the story moves. What starts out as a cool premise quickly becomes the usual Adam Sandler fare, with a lack of storytelling and some incredibly dumb and immature humor. On top of that, while we appreciate the video game references this film gives us, it is clear that there could have been so much more. The movie chooses a select few games to represent, and really should have put more effort into giving us as much as they could. This is a film with a fine first half, that just gets dumber as it goes along to the point where it ends up becoming just like every other Sandler movie made in the last decade. 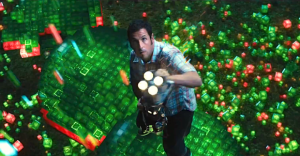 Pixels is not a very good movie, and yet it is the best Adam Sandler in years. In fact, it’s pretty much the best Sandler movie in decades (not counting Punch Drunk Love.) That’s because it’s the first movie of his in ages that is actually inspired by something longer than just a longline one-sentence premise. This movie is nspired by a very cool short film where video game pieces from our 80s Nintendo and Atari game systems fall down from space and start attacking us. The nostalgia elements that have a sort of Wreck It Ralph vibe, work, as they reference beloved characters from our childhood pasts. The story works (to an extent.) But the characters and humor don’t, and that’s where the movie falls short of the mark. At the start of the film, we meet each of our characters as a kid in an arcade video game competition. There’s Brenner, Will, Eddie, and Ludlow. Brenner is the regular guy, average joe protagonist (who will later be played by Sandler.) Will is his best friend, (who will later be played by Kevin James.) Eddie is the competition, (a trash talking angry dude, later to be played by Peter Dinklage,) and finally there’s a the wonder kid, an outcast crazy guy full of conspiracies, (later to be played by Josh Gadd.) All things considered, the casting here is pretty good. It’s nice that for once Sandler didn’t just grab up all his usual SNL buddies. Guys like Rob Schneider, David Spade, and Chris Rock are nowhere to be found, and that’s a good thing. Dinklage and Gadd are much better fits for these parts. The childhood competition ends with Brenner losing to Eddie and then walking away feeling like a failure. There’s no mention of his coming in second place and how much of an achievement that is. The next thing you know, we are with Brenner as an adult, following him along as he goes around installing new TV sets in people’s homes. He goes to the home of Violet, (Michelle Moynahan,) and finds her crying in a closet. That’s when Brenner sits down beside her to talk and tries to get in a kiss. Her reaction of shock and disgust is great. This is actually some of the best stuff in the movie. It’s the only content that feels real or human, and where the humor isn’t ridiculously immature. And now we start learning of the alien invasions. This movie drops the ball as it goes on in a number of ways and a big one of these ways is that it doesn’t explore the video game characters nearly enough. Where’s Mega Man? Where’s Mario? (At one point we see the character run by for a blink and you missed it flash in the background.) Instead, we get all of three games that are explored. Each one is like a new level of a videogame (which is kind of cool,) but this movie could have given us so much more. The first game is Centipede. There’s a tiny look at Galaka, where we see the spaceships on a radar and our heroes assess that the aliens are using Galaka formation, but Centipede is the real attack our heroes take on. The way it happens is, the military steps in, and when they can’t do the job of blasting the video game attackers out of the sky, our shlubby heroes take over. Really? I get that they’re good at video games, but how bout the fact that they are out of shape and gave probably never fired s gun before? The same sort of thing can be said about the Pac Man sequence through the streets of New York. Our heroes are in bright Mini Coopers, each one a different color. The reason, of course, is so they can look like the multi-colored ghosts chasing Pac Man. Pac Man eats the flashing ball which enables him to go after the ghosts, (just like in the video game,) and suddenly it’s our protagonists who are on the run. This Pac Man sequence is pretty cool. Especially in how it uses a clever way, (that relates directly to the real game,) to have our heroes solve their problem. But now it’s time for Donkey Kong, and this stuff is just stupid. By this point, the viewer has run out of patience and the movie has run out of effort. Donkey Kong is supposed to be nostalgic since it’s the game the characters played in the tournament when they were kids. If this mobiecreally wanted to get nostalgic, it would have given us more characters from our pasts. Tetris is only used for one quick moment. The Duck Hunt dog also appears briefly, with a duck in his hand, and then disappears. And we are left wanting so much more. Zelda, Double Dragon, Contra. The list goes on and on. Aside from droppI got the ball with the characters, the movie also does this with the story. Having the president be a friend, and not a member of the team, was a great move. Similarly, it was smart to not have the Michelle Monahan character not be part of the team. These characters have their own this going on, and not everybody can be an expert videogame player. Only by the movies end, all that goes out the window, and everyone is, indeed, on the team. Pixels isn’t bad, but it’s not very good either. It’s the best Sandler movie in ages simply because it relies on more than just his awful brand of humor. Sandler movies have had decent looking premises before, (That’s My Boy,) and turnoed out to be absolutely terrible. That’s because the premise is only enough to get you in the door, and then the one-note plot and awful humor take over. 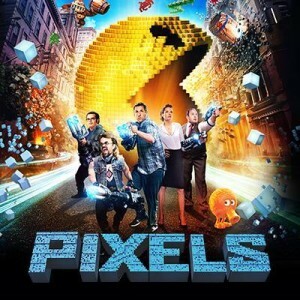 With Pixels, we at least get the somewhat original story, and some cool references to video games. If only there were more. This movie could have done for video games what Who Framed Roger Rabbit did for animated characters (bridging Disney and Looney Tunes characters together,) but it just refused to take that leap. And the humor, like all Sandler movies since his early days (Billy Madison, Happy Gilmore, The Wedding Singer,) is God-awful. This guy is just not funny anymore. He doesn’t play the dude with the hot temper these days (that’s what he played in all three of those other movies,) but instead the regular joe who gets to laugh at his idiot friends. It doesn’t work. This guy’s humor hasn’t been funny in decades, and it doesn’t get any funnier here. The movie is decent because of its premise and video game references and not a whole lot else.